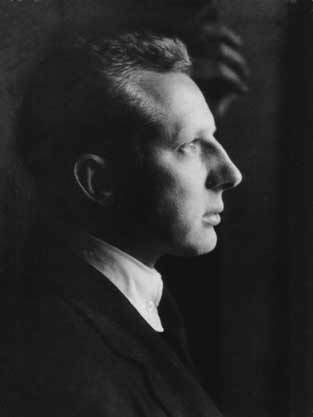 Leopold Stokowski conducted his last concerts of the 1926-1927 Philadelphia season in April, 1927. By this time, he had conducted the Philadelphians for 15 years, and he seems to have wished for a break. He had long planned to take a vacation, but during 1926, following his marriage to Evangeline Johnson, whom he had married in January 1926, this planned vacation developed into a prolonged "leave of absence" from Philadelphia. The reasons Stokowski gave for this leave were various, including discomfort in holding the baton (or "baguette", the French term, as he preferred to call it). He also mentioned later a 1927 taxicab accident in New York City, which Stokowski said had injured his arm. "...During the year, Stoki complained frequently of neuritis. He was still using a baton and during concerts it was noticed that he often shifted it from one hand to the other. It will always remain a mystery whether the problems of neuritis were as serious as they seemed or whether it was a partial excuse to obtain a year's leave..."1. 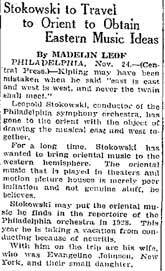 Perhaps Stokowski simply needed a prolonged rest from the Philadelphia Orchestra. This was in the era where it was expected that the permanent conductor of an orchestra would conduct all or nearly all of the scheduled concerts. In any case, from November, 1927 until early September, 1928, Leopold Stokowski and Evangeline Johnson Stokowski traveled to Europe and Asia1 in a voyage of nearly one year. 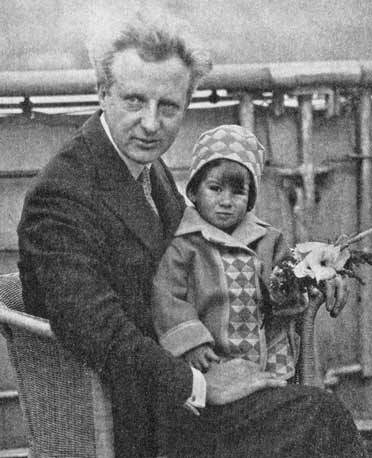 Leopold Stokowski arrived back in New York on 7 September 1928 on the SS Orinoco from Southampton, England with Evangeline and Luba Stokowski (whom her father called "Lyuba"). Evangeline and Luba had boarded at Boulogne, France, and Leopold joined them on board at the next port in Southampton. Leopold and Evangeline had previously reunited with Lyuba in Switzerland where Luba had stayed while her parents toured Asia. From Switzerland, the three went to Paris at the end of the Summer of 1928. Stokowski at some point went on to London. During this period of international travel, and because he missed the Philadelphia Orchestra season of 1927-1928, Stokowski and the Philadelphia Orchestra of course did no recording. However, the year of 1927, prior to Stokowski's departure, was one of Stokowski's most intensive and also most successful recording periods. Stokowski and the Victor Talking Machine Company apparently intended to fill the Victor vaults with sufficient Stokowski recordings to carry them through late 1928 when he would return. This intensive recording program of Stokowski and the Philadelphians extended from March 1927 until late October 1927, just before he and Evangeline departed to New York to board their ship to Europe, the beginning of nearly one year of extended travels. Stokowski's Victor Red Seal recordings during 1927 included Bach, Berlioz, Bizet, Debussy, Glazunov, Ippolitov-Ivanov, Liszt, the Stravinsky Firebird Suite and four major symphonies: Beethoven Symphony no 7, Brahms Symphony no 1, the Franck Symphony in D minor and a new recording of the Dvorak New World Symphony. Each of these recordings would become among the most famous and successful of Stokowski's long recording career. With this intensive explosion of creativity, the symphonies in particular are among the most inspired recordings ever made by Stokowski during his 60 years in the recording studio. They are also among the first recordings, now made with the dramatically improved electrical process to provide listeners with a realistic picture of a fully symphony orchestra in virtuoso performances of the great classics of the symphonic repertoire. Also, as can be heard from these recordings, compared with contemporary recordings, including of some of the famous European orchestras, the Philadelphia Orchestra under Stokowski showed a level of ensemble, intonation and beauty of playing which contrasted with the lax playing and lack of ensemble of some of the "great orchestras of the day which is surprising to us today. The conservatoire trained orchestra musicians who entered the leading orchestras in the middle of the twentieth century raised the level of precision and quality which we take for granted today, but which was so often missing in the 1920s, and presumably earlier. Not only was the beautiful sound picture which Stokowski so assiduously cultivated in his orchestral performances and the inspiration of these performances new, but the musical experiences brought with these new recordings was also new. For many (or perhaps most) of those who purchased these albums, these were their first hearing of a full symphony orchestra playing these symphonies (or any symphony). The radio was not yet broadcasting full symphony orchestra concerts, and many people lived hours away from the few cities which in that era supported a symphony orchestra. In 1927, many, including those who were affluent and educated had never heard a symphony played by a symphony orchestra. 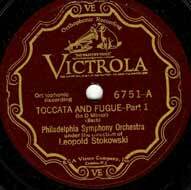 These Stokowski - Philadelphia Orchestra albums, which sold well, and the later expanded radio broadcasts of a number of the leading symphony orchestras helped to change that in the 1920s and 1930s. On 6 January 1927, Stokowski and the Philadelphia Orchestra began their 1927 recording sessions with Wagner. They recorded the last three sides of Wagner's Overture to Rienzi, which had begun in November, 1926 ( click here to read about the 1926 Rienzi Overture). Then, as a 'filler', they recorded an additional side consisting of the Closing Scene from Wagner's Götterdämmerung. This is the monumental concluding music from the Ring cycle --- music after Brünnhilde has ridden Grane onto her funeral pyre. The Rhine overflows, Hagen attempts to seize the ring, but the Rhine maidens regain it. In the distance, the sky is filled with fire, Valhalla is revealed consumed in flames. Valhalla then collapses with Wotan and the gods seated within. Brünnhilde, through her love for Siegfried has cleansed the world of its corruption. Underlining this transformation, the key of the final music changes from E flat to D flat, concluding Wagner's four operas telling the story of the Ring. This of course is a dramatic story and dramatic music, and it is matched by this stirring performance by Stokowski, although perhaps lacking the ultimate magic of Stokowski's 1933 recording of this music. The score of this closing scene is slightly cut. Music that usual takes about 5 1/2 minutes to play, is cut to just over 4 minutes so as to fit onto one 78 RPM 12 inch (30 cm) side. The playing by the Philadelphia Orchestra is at the peak of its form, with silky, lush strings, and a performance that is dramatic, yet not over-blown. Have a listen to this performance, still satisfying so many decades later. This recording was issued as Side B of Victor 6625, a 12 inch (30 cm) Red Seal disc and in Europe on Gramophone D-1227. Both were coupled with the Rienzi Overture and the matrix for the Götterdämmerung side was CVE 37702-2. The orchestra used for this recording was large: 17 first violins, 16 second violins, 13 violas, 12 celli, 9 double basses, 4 flutes, 4 oboes, 4 bassoons, 5 clarinets, 6 French horns, 4 trumpets, 3 trombones, 2 tubas, 2 harps, 1 tympani, and 3 percussion, 105 musicians in all. 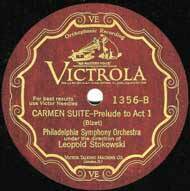 On Thursday, 10 March 1927, on Saturday, 30 April, and then on the following Monday, 2 May 2 1927, Stokowski and the Philadelphians recorded a number of excerpts from George Bizet's 1873 opéra-comique Carmen. First, on 10 March in the Academy of Music, they recorded two 10 inch (25 cm) Victor Red Seal sides, the Prélude to Act 1 of Carmen and the Prélude to Act 4, entitled "Aragonaise". The Prélude to Act 1, matrix number BVE 22812-5 was on the first side of Victor Red Seal 10 inch (25 cm) disc 1356, and the Prélude to Act 4 Aragonaise, matrix BVE 38211-1 was on the other side. The Prélude to Act 4 begins with a gorgeous oboe solo by Marcel Tabuteau. This oboe theme continues to be interweaved throughout the piece. Also, when you listen to this music, you will notice the flair and beautiful sheen of the Philadelphia strings. This seems unmatched by other orchestral recordings of that era. What a beautiful performance, and in excellent sound. The following 30 April 1927, continuing with Carmen excerpts, Stokowski recorded the Prélude to Act 3 entitled Intermezzo, and the entr'acte, or Prélude, entitled Les dragons d'Alcala which is played as an introduction to Act 2 of the opera. "Les dragons" were the soldiers stationed in Seville, and one of whom is Don José. The music of the Intermezzo and of Les dragons d'Alcala were combined by Stokowski onto one side of a 12 inch (30 cm) Victor Red Seal disc 6873, matrix CVE 37494-2. What beautiful playing of the Intermezzo theme ! On the other side of this Victor disc 6873 is the Gypsy Dance from Act 2, matrix number CVE 37498-1. 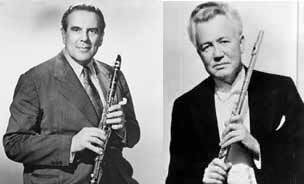 William Kincaid flute and Daniel Bonade, clarinet, and the strings of the Philadelphia Orchestra are at the top of their form. 89 musicians made this recording, including 33 violins, 12 celli, 9 double basses, 4 flutes and 4 oboes, 6 horns, and generally the full orchestra, including 3 percussionists. This recording shows what a great symphony orchestra the Philadelphia had become under Stokowski, arguably unsurpassed in the world (at least on the surviving evidence of recordings of the period). These two excerpts were issued on the first side of a 12 inch (30 cm) Victor Red Seal 6873, matrix number CVE-37494. In the last Bizet session that year on 2 May 1927, they recorded three other excerpts from the Carmen Suite. First was the Gypsy Dance also known as Danse Bohème from Act 2. This was issued on the second side of Victor Red Seal 12 inch (30 cm) disc 6873, matrix number CVE-37498-1. In Europe, the recording was issued by the Gramophone Company on D-1816. This was followed by the March of the smugglers, or to give it its French title: Marche des contrebandiers from Act 3 and also the Soldiers changing the Guard or Avec la garde montante from Act 1. These excerpts had been recorded only 4 years previously using the acoustic process: the 1923 versions of Avec la garde montante and Marche des contrebandiers. "Marche des contrebandiers" was issued on one side of Victor Red Seal 12 inch disc 6874, matrix CVE-27902-2 and "Avec la garde montante", matrix CVE-27903-2 was on the other side. It was issued in Europe on Gramophone D-1618. The sound of the Marche des contrebandiers, while good is not so transparent and wide ranged as, for example, the Danse Bohème. Overall the sound of these discs are remarkably good, recorded more than 85 years ago. Recall that this was only two years after the introduction of electrical recording. In particular, listen to the Danse Bohème and see if you don't agree as to the excellent reproduction of the orchestral scene. The musical excerpts below are listed in the order of their appearance in the opera, Act by Act, since the original 78 RPM discs do not indicate any particularly order, and the discs were all sold separately. Stokowski's other March 1927 recording sessions began on March 3 and continued on March 10 in the Academy of Music. During these sessions, as well as the Carmen excerpts, they finished a revised side for the 1926 Liszt Hungarian Rhapsody no 2. 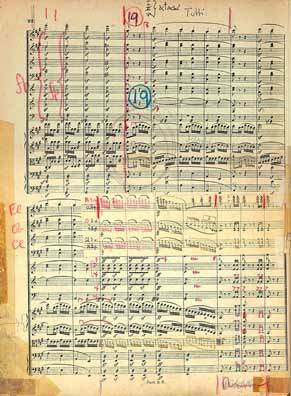 Then, during the March 10 session, Stokowski and the Philadelphia Orchestra made a famous recording of the Debussy Prelude to the Afternoon of a Faun (Prélude à l'après-midi d'un faune). Debussy wrote his evocate music inspired by a Mallarmé poem of that same title. Its compositional style, breaking with classical and romantic traditions is considered by many as the beginning of Twentieth Century modernism in music, even though written in 1894. The Prélude à l'après-midi d'un faune begins with a gorgeous flute solo played by William Kinkaid. The recording, which was from takes 8 and 9 of the March 10 recording session, shows the strings of the Philadelphia Orchestra in their full glory. Debussy's score has a delicate orchestration, and this recording uses a full orchestra of 16 first violins, 17 second violins, 13 violas, 12 celli, 9 double basses, 4 flutes, 4 oboes, 5 clarinets, 4 bassoons, 6 French horns, 3 trumpets, 3 trombones, tuba, 2 harps, tympani, and percussion. Stokowski performed and recorded Prélude à l'après-midi d'un faune many times over the next 50 years, but this 1927 recording, even with its early sonics, must be among his very best performances, still moving and inspiring more than 80 years later. This recording was issued on two double-sided Victor Red Seal 12 inch (30 cm) discs Victor 6762 and 6763, coupled with the May 2, 1927 Weber Invitation to the Dance. In Europe, it was issued by the Gramophone Company on HMV D-1768. The matrices were CVE-21057-9 and CVE-21058-8. Then on 6 April 1927, Stokowski recorded the first of his famous Bach organ transcriptions for full orchestra: the Toccata and Fugue in D minor BWV 565. This was Stokowski's first recording of one of his orchestrations of a Bach organ work, and his most well-known to the public as a result of this and later recordings. The richly upholstered, rubato filled orchestral texture is not to everyone's taste. The more transparent Bach organ works, such as the Bach Passacaglia and Fugue BWV 582, seem (to me) to work better, particularly in a lighter orchestration. However, the more full orchestration employed in this transcription by Stokowski may be more evocative of the full-throated sound of a large church organ. Regarding these Bach transcriptions, Stokowski argued that, except for these orchestrations, the public was unlikely to have access to these great works of Bach. This was likely to be the case in particular in this early era of recording. This fine recording and performance can still be enjoyed today to appreciate Stokowski's craft. April, 1927 also witnessed the first American recording of the complete Beethoven Symphony no 7, and what a fantastic recording it was. Stokowski was not thought of as one of the leading conductors of Beethoven, as were Furtwängler, Toscanini, Weingartner, or even Mengelberg or Koussevitzky. Stokowski never recorded all nine Beethoven symphonies, either commercially or privately. However, in these series of 1927 recordings of the majestic pillars of the classical music repertoire, such as the 1927 Brahms Symphony no 1, the 1927 Schéhérazade, the 1927 Dvorak New World symphony, and this Beethoven Symphony no 7, Stokowski and the Philadelphia Orchestra were at their blazing best. Also, I believe that the recorded quality Stokowski and Victor obtained in the Academy of Music in Philadelphia were unmatched by other orchestras and recording companies of the late 1920s. In 1927, Stokowski also adopted the felicitous practice of adding a side of explanation to his listeners of major works being recorded, explaining themes and structure. Although to some, today, these Stokowski talks seem superficial and exaggerated as to content, it should be kept in mind that for many and perhaps most listeners, this would be their first hearing of the work being performed. In fact, given the infancy of radio, and the fact that movies were still silent at that time, and that most listeners lived far from the few cities supporting a symphony orchestra, these recordings could well be for many listeners their first exposure to orchestral music. Please click on the links below to listen to (download) this recording, including the Stokowski analysis to themes and structure of this symphony, which was issued by Victor as M-17 in the Musical Masterpiece series. Just after the Beethoven Symphony no 7, on 6 April 1927 in the Academy of Music, Stokowski and the Philadelphians recorded the Schubert Moment musical no 3 in F minor (D780-3). This work was a brief piano piece, transcribed by Stokowski to which he gave the title Russian Melody in his orchestration. This is a remake of the Schubert work that Stokowski recorded acoustically five years earlier on 27 January 1922. This recording was issued by the Victor Talking Machine Company on a 10 inch (25 cm) Victor Red Seal disc 1312, matrix BVE 25941-8. It was coupled with the 11 October 1927 recording of the ballet music from Rosamunde. This Schubert recording does not seem to have been issued by the Gramophone Company, although an HMV catalogue number was assigned: 7-906. The full orchestra was used for this recording: 17 first violins, 17 second violins, 12 violas, 12 celli, 8 double basses, 4 flutes, 4 oboes, 5 clarinets, 4 bassoons, 6 horns, 4 trumpets, 3 trombones, 2 tubas, 2 harps, 1 tympani, and 3 percussion. Then, during April 25, 26, and 27 in the Academy of Music in Philadelphia, Stokowski and the Philadelphians recording one of their most famous and satisfying recordings: the 1927 Brahms Symphony no 1 in C minor. Stokowski, throughout his career, was one of the great conductors of Brahms's Symphony no 1. Also, Stokowski seems to have programmed the Brahms First or the Brahms Third at critical points of his career, where the success of a concert was important for him. These 1927 recording sessions brought us some of Stokowski most memorable recordings from any era. This Brahms Symphony no 1 is certainly one of them, and perhaps his finest performances of that symphony, and a highpoint of his career. This 1927 recording was issued as Victor Musical Masterpiece album M-15. It was made up of five 12 inch (30 cm) Victor Red Seal discs 6658 through 6662. In Europe, the Gramophone Company issued the symphony on HMV D-1499 through HMV D-1503 and in France on La voix de son maître discs W 998 through W 1102. The matrices were CVE 37483-2, CVE 37484-2, CVE 37485-2, CVE 37486-1, CVE 37487-1, CVE 37488-2, CVE 37489-1, CVE 37490-2, CVE 37491-1, and CVE 37492-2. A full orchestra was used in the Academy of Music, consisting of 18 first violins, 18 second violins, 13 violas, 11 celli, 9 double basses, 4 flutes, 4 oboes, 4 bassoons, 5 clarinets, 6 French horns, 4 trumpets, 3 trombones, a tuba, and tympani. This recording stayed in the Victor catalog, selling well year after year, until the new 1936 recording of the work was issued on Victor Red Seal M-301. The 1936 Brahms, while a good recording, does not in my opinion match the inspiration, sweep, and orchestral brilliance of this 1927 performance. Monday, April 25 through Thursday, April 28, and Saturday, April 30, and the following Monday and Tuesday, May 2 and 3, 1927 were intensive recording sessions for Stokowski and the Philadelphia Orchestra. (The concerts in the Academy of Music on April 29 and 30 were the final concerts of the 1927-1927 Philadelphia Orchestra season). These recording sessions also produced some of the most successful recordings they ever made together: finishing the Symphony no 7 in A, the Brahms Symphony no 1 in c, and the Symphony no 8 in b 'Unfinished'. Each of these recording may well have been the finest recordings Stokowski made of these works, including during the fifty years of recording yet ahead of Stokowski. This was certainly the case for the Brahms Symphony no 1 and the Schubert 'Unfinished', which Stokowski never surpassed (in my opinion) with the Philadelphia or other orchestra recordings. Also, the sound of these 1927 recordings is remarkably clear, clean, and wide-ranging, particularly considering that Victor had been using the electrical recording process only two years. Contemporary U.S. and European orchestra recordings of the era do not match these three works either in interpretation, or in sound. Also, Stokowski brought a concentration, and inspiration, and a breadth and depth of vision to these recordings that were somehow lacking in his later efforts. This was indeed a miraculous year for Stokowski, the Philadelphians and for Victor. Recall that Stokowski and the Philadelphia Orchestra made a recording for Victor of this Schubert symphony using the acoustic recording process almost exactly 3 years previously. It is interesting that the timing of each of the two movements are within seconds of each other in both the acoustic and the electrical versions, running a total of about 22 1/2 minutes. Enjoy listening to this fine performance of the Schubert 'Unfinished' symphony by clicking on the links, below. Then on May 2, 1927, Stokowski and the Philadelphia Orchestra recorded Glazunov's Danse orientale from his Scènes de ballet opus 52. This work, which Glazunov wrote in 1894, was a concert piece, not intended for dance or ballet. The Danse orientale was the sixth movement in this concert work. Stokowski used a full Philadelphia Orchestra of 17 first violins, 17 second violins, 13 violas, 12 cellos, 9 double basses, 4 flutes, 4 oboes, 5 clarinets, 4 bassoons, 6 horns, 4 trumpets, 3 trombones, a tuba, 2 harps, tympani, and percussion. This is an atmospheric and definitely "oriental" reading which makes this somewhat light-weight work seem to be music of merit. This recording was issued on a ten inch (25 cm) Victor Red Seal disc 1335 B, side B, coupled with the Ippolitov-Ivanov Caucasian Sketches Procession of the Sardar. In Europe the Gramophone Company issued it on HMV 8-633. The matrix number was BVE-37499-1. Carl Maria von Weber wrote his Invitation to the Dance (Aufforderung zum Tanz) opus 65 in 1816 for piano; a piece not intended as a waltz for dancing, but rather an evocation of the waltz. This piano piece became popular as an orchestral work, recorded often in the acoustic era. For example, Édouard Colonne had recorded it in 1907 for Pathé. ( Click here to listen to the 1907 Colonne recording of Invitation to the Dance. In fact, according to C. G. Arnold 3 there were 13 other orchestral recordings of this work during the acoustic recording era alone. 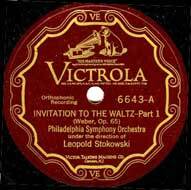 This count increased to 14 with the Stokowski - Philadelphia Orchestra 1919 fine acoustic recording of Carl Maria von Weber's Invitation to the Dance, in the orchestration by Felix Weingartner. Now, for this 1927 recording of in the Academy of Music, Stokowski recorded what was perhaps his finest recording of this work made during his sixty years of recording, this time in the Berlioz orchestration. This recording has a lightness and transparency with lilt and yet also drama. The relaxed and stylish performance with the full effect of the Philadelphia Orchestra virtuosity provide a recording of this often-played work that Stokowski did not quite achieve (in my opinion) in his later recordings over the next five decades. The Weber Invitation to the Dance was recorded May 2,1927 in the Academy of Music with a full orchestra consisting of 17 first violins, 17 second violins, 13 violas, 12 celli, 9 double basses, 4 flutes, 4 oboes, 5 clarinets, 4 bassoons, 6 horns, 4 trumpets, 3 trombones, a tuba, 2 harps, tympani, and 3 percussion. This recording was issued on on a Victor 12 inch (30 cm) double faced Red Seal disc catalogue 6643 matrix CVE 37495-1 and CVE 37496-2. In Europe, it was issued by the Gramophone Company in HMV D 1285 and in Germany Electrola disc EJ 166. The performance and sound are both fully satisfying, with and openness and freedom that Stokowski did not seem to capture in his later recordings with the Philadelphia Orchestra, with his All-American Youth Orchestra, or with "His" symphony orchestra. It is in precision, detail and ensemble that the contemporary leading European orchestras seem to be lacking, at least as witnessed by their recordings. Click below to hear this grand 1927 performance. And 1927 Philadelphia Recording Was Not Yet Finished ! As they say in show business: "But wait ! you ain't heard nothin yet! There's more !" And this certain applies to the wonderful year of 1927 filled with recordings made by Stokowski and the Philadelphia Orchestra. 1 pages 200-210. Daniel, Oliver. Stokowski A Counterpoint of View. Dodd, Mead & Company. New York. 1982. ISBN 0-396-07936-9. On this 1927 - 1928 voyage, Leopold and Evangeline sailed to France (with Luba who was left with friends in France), and from there to Jerusalem. Their travels thereafter were extensive: Damascus, Bagdad, Karachi, Bombay. In India, they traveled extensively around the sub-continent. Then to Burma, Djakarta, Bali. They then returned to Switzerland to be reunited with Luba, and then back to Paris. 3 Arnold, Claude Graveley, C.S.B. The Orchestra on Record, 1896 - 1926, An Encyclopedia of Orchestral Recordings Made by the Acoustical Process. Discographies, Number 73, Greenwood Press, Westport Connecticut. 1997. ISBN 0-313-30099-2.